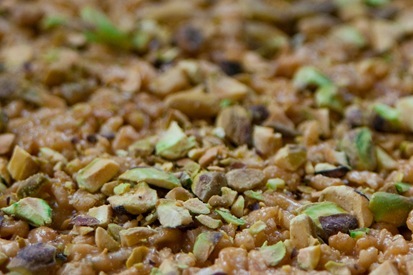 Again, I was tempted by the amazing photography and simplicity of this recipe on 101cookbooks.com. I did change up a few things with the recipe! It calls for 3/4c. of maple syrup. The smallest bottle you can find will cost you about $7.99 and I just didn’t want to dish that out for a dessert recipe. So, what could be substituted? Ahh, perfect, brown rice syrup + a little honey! I happen to have a LOT of jars of brown rice syrup because it is an ota.ingredient, and I never made it through my whole supply. I will go over brown rice syrup after I finish about this recipe. The other thing I changed was instead of using agar agar flakes for thickening, I used an organic tapioca starch. I couldn’t find agar agar at Whole Foods and tapioca starch was only $2.50. It seemed to work perfectly. So, instead of 3/4c. maple syrup I used about 1/2c. + 2T brown rice syrup and 2T honey which totals 3/4c. sticky liquid. Make sure to get CRISPY brown rice cereal and not puffed rice cereal. 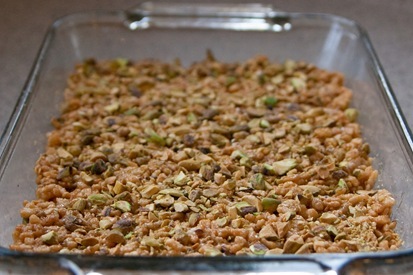 I mixed in and topped this with pistachios but really any nut or a mixture of nuts would work perfectly. If you want even more pnut flavor add peanuts. Next time I might try an almond/walnut combo. Next time is going to be very soon! It was such a tasty treat right out of the fridge. A rich pnut flavor but not overly sweet, thanks to the brown rice syrup. 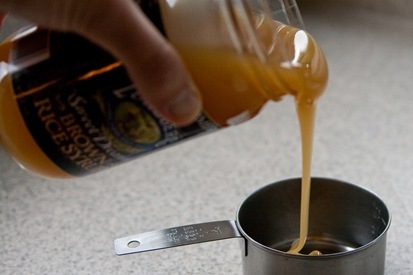 Maple syrup might have been too sweet for me, so I was glad I substituted! So, a little bit about brown rice syrup. 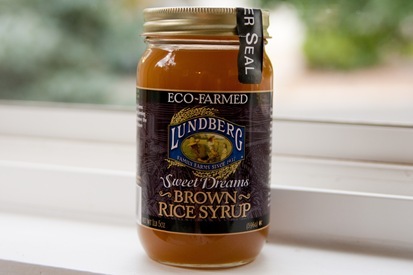 I haven’t come across too many brands on the market and have always found Lundberg to have the BEST brown rice products. From their brown rice chips to the cereal to the syrup, I love Lundberg’s products. 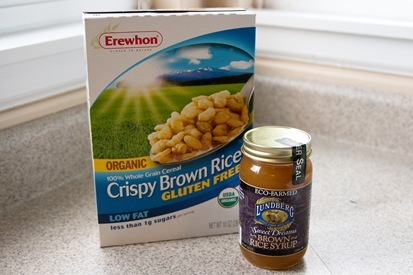 Brown rice syrup is one of the healthiest sweeteners you can use because of how it breaks down in your body. It metabolizes much more slowly, in comparison to white sugar or maple syrup, which will keep your glycemic index level at a steadier rate. This will help avoid the sugar high and crash feelings. This 21oz jar will run you about $4.50 at Whole Foods, which is the cheapest place I have found it. I utilized WF’s case discount, for an extra 10% savings, when I bought it for ota.bars. Now, on to dinner! This one just came out of my brain…it is amazingly easy…and a good way to clean out the fridge! Whole Foods had their grass-fed beef on sale for $2.99 this week!! I will definitely be going back to stock up on this yummy grass-fed beef, while it is so wallet friendly! I decided to make a simple pasta bake. Easy, full-proof, recipe. The Vodka sauce was also on sale at WF’s for $4.00, when it is normally $8.00! Loved it! I had leftover spinach to use up, 1 leftover leek from last nights dinner, and 1 yellow squash. I grated the squash so it wouldn’t be as pronounced of a texture in the bake. I didn’t want it to stand out as it can usually get quite squishy in the center, when cooked. That made it SO much better. The leek added the perfect amount of oniony flavor. Boil the pasta until al dente. [It will finish cooking while it’s baking in the oven.] Brown the meat and add a few shakes of salt/garlic powder/pepper. Drain the meat. 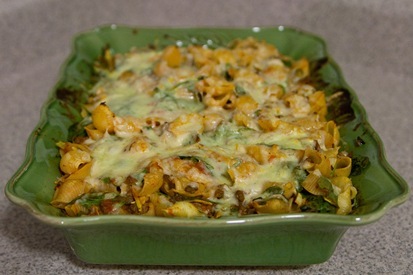 Add all the ingredients [except for the cheese] to a 13x9 baking dish. Toss until combined. Cover with foil and bake for 30min. Uncover and top with cheese and broil for a few short minutes until the cheese is bubbly and a little browned. When broiling, it is best to leave the oven light on or oven door cracked slightly to keep an eye on your food. It can burn fast! You can substitute any of the veggies for whatever you want. 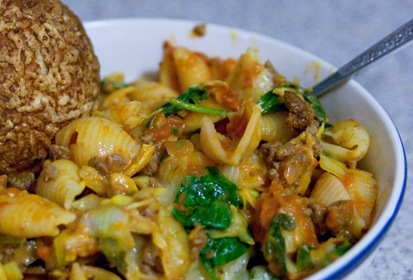 I would say that this combo worked really well and was delicious with the vodka sauce. 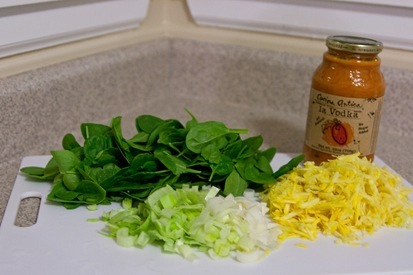 It had the perfect amount of moisture which can sometimes be an issue with runny sauce or wet veggies. Off to play with Laura!!! Soooo excited! Tomorrow we’re all going to the Great American Beer Festival in Denver. We’ll probably get some climbing in at the gym and hopefully a hike or run at some point too!